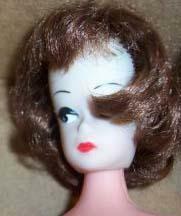 In 1955 the Bild Lilli doll was first sold in Germany and is unmarked. 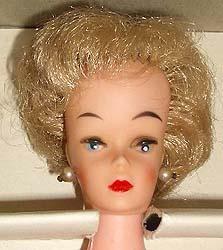 In 1959 Mattel made their Barbie doll loosely based on or similar to the Bild Lilli doll and is clearly marked Mattel. So who made all those Barbie doll clones, competitors, knock offs and look a likes? Here are some of the 11 1/2" teenage hi-heeled, fashion dolls that were clones or competitors of Barbie, that we have found. American Character Tressy doll, 1964-1967, grow hair doll, Magic Make Up Tressy, Mary makeup, and sister Cricket and her friend Toots. See the Tressy page for more details and photo's. Evergreen used. They also made a Peggy doll that was a Skipper clone with a freckled face, later they changed it to a Francie like face mold but still on a 9 1/2" size body. Fred was Petra's boyfriend and is a clone of Barbie's Ken doll boyfriend. Evergreen Miss Teenager U.S.A. doll 1960s, 11 1/2" tall, had blonde ponytail hair, cheaper hollow plastic body, straight legs - Marked: Evergreen, British Colony of Hong Kong, wears a white ribbed knit swimsuit with a red ribbon with the dolls name on it, pearl earrings in pierced ears, white high heel shoes. Genevieve Fashion Doll 1960s, 8" or 11 1/2" tall, rooted hair, painted features, dressed and boxed, Made in Japan, doll maker unknown. 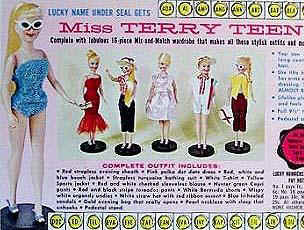 Miss Terry Teen doll, 11 1/2" tall, Barbie head clone, came with 16 additional mix and match fashions, maker unknown. Ideal Mitzi doll 1960s, 11 1/2" tall - also sold by Reliable of Canada - was discontinued in 1962 when they introduced the Tammy doll family. 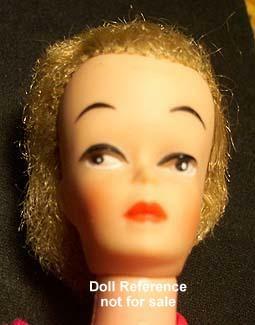 The 1962 dolls have much more exaggerated, slanting eyes. Ideal Tammy Family of dolls 1962-1966; Tammy, Misty, Glamour Misty, Pose N' Misty, Miss Clairol and Samantha (of the Bewitched TV show) 1965. See the Tammy page for more details. Doll Clothes Peggy Ann doll, of Springfield, Mass, 1960s, Made in Hong Kong, 11 1/2" tall, long straight rooted hair with bangs, fully posable, twist waist. Sears Teenage Fashion doll, (shown on left) 11 1/2" tall, don't know dolls name but she's one of the clones and was sold thru Sears in the 1960s. Shillman had a clone doll, 11 1/2" tall, also lots of individual outfits. 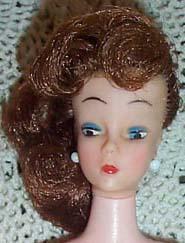 Uneeda Suzette doll 1962, 11 1/2" tall, often called the "Big Head Suzette doll". Marked on back: ©/Uneeda/Doll Co./Inc./1962. She has large black iris eyes that are slanted, a unique body construction that is like a Y, with the legs attached to the Y's stem. See the Uneeda Doll page for more details and photo's. Uneeda Suzette doll 1960s, 11 1/2" tall, this one has the Lilli clone head with bubble cut or ponytail hairstyle, non-bendable straight legs one piece hollow plastic body. This doll is not marked as the doll above and once you see their faces and body would not be mistaken for one another, probably has the U on back of neck, and may have Hong Kong or no markings on the body. See the Uneeda Doll page for more details. Valentine Polly doll 1960s, 11 1/2" tall, marked: on back with an arrow thru a heart. This unmistakable Barbie face has almost straight across eyebrows which make her look, at least to me, as though she is perpetually asking her owner "Why Me?". This doll was also cloned with the copies being made by an unknown manufacturer. 1960s Polly Play Posy doll, 11 1/2' tall, brunette bubblecut hair style, made in Japan, she also has a face that also seems to be saying "why me?" Polly is posable, multi jointed and is very rare. Doll maker is unknown. 1963 Debbie Drake doll, 11 1/2" tall, we think she was made by Reliable, doll is unmarked, multi-jointed body; neck, shoulders, elbows, wrists, waist, upper thighs and knees, vinyl head with rooted blonde or platinum bubble-cut style hair, wore a red/pink leotard body suit just like Debbie Drake wore on her fitness TV show. Doll is very unusual and very rare. Her face kinda reminds us of the above Reliable Mitzi doll but with less exaggerated high eyebrows. 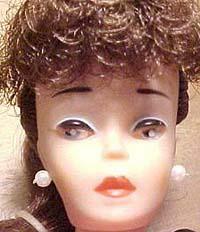 Photo's below of the Debbie Drake doll courtesy of mike*jeff, shown in original clothing and mint out of box. Thank you, mike*jeff! 1963 Debbie Drake doll, 11 1/2"
on the multi-jointed Bonnie doll shown on right. Genevieve Fashion doll, 11 1/2"
1961 Mitzi doll by Reliable of Canada, 11 1/2"
1960s Peggy Ann doll 11 1/2"
1962 Marx Bonnie doll, 11 1/2"
1970s Totsy Twistee doll, 11 1/2" tall, vinyl head with rooted hair, painted facial features, light weight blown plastic body, twist and turn waist, wore a one piece swimsuit, unsure how/if marked.